I meant to tell you more stories today. I meant to tell you about the neighbourhood market, the home brined olives, the pile of juicy organic oranges in our kitchen, the street foods, the people, the roadside vendors, the local art, the local music, the regional clothes, the sand, the sea and the warm days. I meant to tell you all. I meant to tell you about the unforgettable couscous with swordfish my mother made on a beautiful sunny Friday. She usually uses grouper, which I personally prefer, but swordfish isn’t a bad choice either. 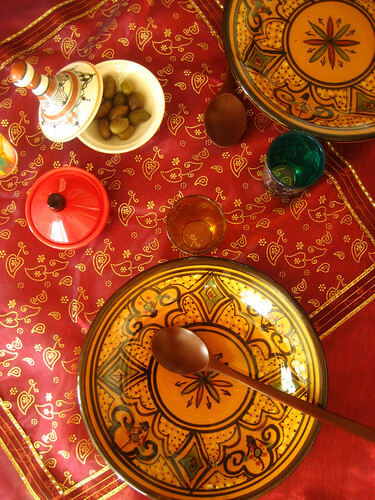 We took out the gorgeous plates her friend Hassiba made for her and we feasted on couscous, grapes and dates. We were full, we were dizzy and we all took a nap, which was very appropriate on a heavy Friday afternoon. I apologize if there will be no recipe of the couscous today, but I wanted to stop by to wish you all a happy, blessed and exquisite Thanksgiving Day. I am sure your kitchen, and your family, must be whistling of excitement. And in case you need some last-minute ideas, what follows is some of my falls favourite. And for you at home a happy, happy Thanksgiving too. Thank you for sharing your wonderful visit with us. Have a lovely time with your family! And what a gorgeous photograph. I'm so sorry we'll miss you on the 13th, but so glad you'll be off with sea, sand and dates!